As of 14 September 2014 there are only 18 tickets left for this event! I have attached the menu, so you can start to plan the wines to match your food. We are developing individual menu’s for veggie, vegan or gluten free, so please let me know if you have any special requirements. Funds from this event will be split between PAWS, Pennine Animal Welfare, and to help convert one of the toilets in the bowling club for wheelchair users. In order to meet the fundraising target, we need to sell all tickets! 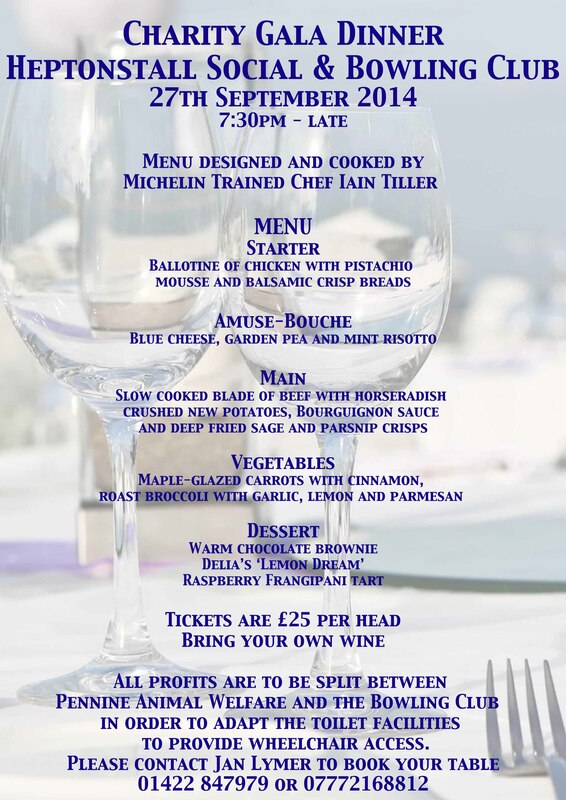 This will be an amazing experience, and our chef will tell us of his experience working for Raymond Blanc, and working in Michelin rated kitchens, as well as cooking our Gala Supper for us! Please check your diaries, and see if you can come! It is another first for Heptonstall, and not to be missed!